Brian Patteson gives us the morning briefing before setting out. Steven N. G. Howell just spotting another great bird! My friend Ed VanBuren and I took a four day trip to North Carolina on the above dates. We departed Yankee Lake at 5 am and arrived in Cape Hatteras at 4pm. We had good traveling weather on the way down. This trip was planned for over a month and our reservations were made in April. Four days prior to the trip, the second Tropical Storm of the year was forecast to hit Cape Hatteras the day that I was to go out on the first Pelagic Trip with Brian Patteson. Brian does not cancel scheduled trips in advance. We were all to meet at the dock at 5 am the morning of the 30th to determine if we could go out or not. Upon our arrival on the 29th, I birded around town and checked out the marina to see our meeting spot. Brian Patteson was just coming in with his tour on the Stormy Petrel 2. He said they had had a decent day and that we would meet at the pier in the morning. That day, they had the second Fea’s Petrel of the season, and many of the regularly expected birds. Around town the best birds I saw were Brown Pelicans, Royal Terns, Laughing Gulls and Boat-tailed Grackles. This was just a few of the 27 species seen that day. We checked into our motel, the Village Marina Motel. It was a nice suite with a living room, kitchenette, Bath and Bedroom. All for $128.00 per night (three nights). The place was very comfortable, but as has happened so many times in the past, the promise of internet fell through with no reasonable explanation (worked for a short time every once in a while). We had dinner at Dinkey’s Restaurant. The food was excellent, but it was a bit pricey. Day Two: Pelagic Birding in Tropical Storm Beryl. I got up at 4am and arrived at the dock at 4:45 not knowing whether the trip was a go or not. The forecast was for rain and high winds in the afternoon, but it was currently fairly calm. Brian arrived in short order and announced that we would be going, but probably heading back by noon. Once we exited the Inlet, it became apparent that the seas were not calm. We had 7 foot waves all the way out. Brian said it would be a wet ride and it did deliver. In no time flat we were all soaked to the skin. Since my attire didn’t include rain gear, I was a bit worse off than most. In no time flat, a huge wave came over the boat and drenched my camera. That was the end of pics for the day (Salt water blew a battery, and it seeped through the camera, apparently irreparably damaged ). Since we weren’t seeing birds, I was beginning to wonder. That didn’t last long. Once we reached the continental shelf, The birds really began to show. Pomarine Jaegers flew close by the boat giving great views. Wilson’s Storm Petrels seemed to be everywhere. Audubon’s and Corey’s Shearwaters outnumbered most of the birds. Shortly, someone yelled BLACK-CAPPED PETREL A beautiful white faced individual passed behind the boat and then followed close by for several minutes. Great views and easy to see field marks. It was nice to see the difference between the two phases with another bird turning up soon thereafter. A while later, two additional BCPE turned up, but I could only spot one of them. Sooty Shearwaters made sporadic appearances with a total of six seen by me. Once the crew spread the oil slick, we would have considerable activity for the next couple of hours. The captain came on to announce a Leach’s Storm Petrel and it obliged by coming close in and giving good comparisons with the Wilson’s Storm Petrels. Steve N. G. Howell (really nice guy and excellent bird guide not to mention renowned author) spotted the first BAND-RUMPED STORM PETREL, that got away before anyone could see it. Steve seemed to know to look in the direction from which the bird had come and sure enough, a second bird came right past the back of the boat giving great views for all. I would get good looks at two more of the three more that were seen. We continued to chum and tremendous numbers of Wilson’s came in. I counted thirty in the slick at one time in just a small stretch. Soon thereafter, the only Parasitic Jaeger of the day made a brief appearance. By now, it was just past noon and the winds and rains had begun to pick up. Brian announced we were heading back in. Waves now were getting really high, some ten feet or more. It was a rough ride for the next hour and a half. As we neared Cape Hatteras, the water got really rough, after some hairy moments getting into the inlet, we made it back to the dock. A great day and safe return to the dock, what more could you ask for. Day three: We met at the dock again this morning. The trip was a definite go. The winds had subsided and the waves calmed considerably. We headed out. Once we got out to the continental shelf (about two hours) it was quite quiet. 45 minutes later I was speaking with Kate. She assured me that though it seemed quiet, one good bird could change everything. She couldn’t have put it better. 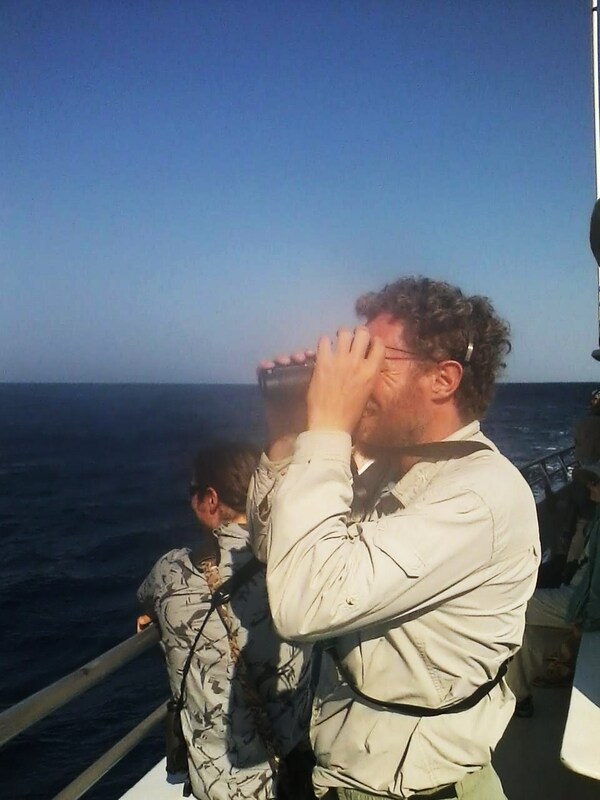 About half an hour later, Steve Howell spotted a Trindade Petrel. I was standing just a few feet from him as he described that it was in the slick directly behind the boat a couple of hundred feet out. No matter how he directed us, I couldn’t spot the bird. It was in a good size flock of storm-petrels and I thought it should stand out. Unfortunately, most of the petrels flying toward us all appeared dark until they would bank. Steve suddenly said it banked to the right behind a swell. A bird suddenly appeared above the swell and he said “that’s it”. I caught a fleeting glimpse before it dropped again. I couldn’t count the bird. It could have been just about anything from what I saw. Fortunately, most of the people got on the bird initially and were pleased with such a great find. I was disappointed. As we continued to look for the bird, Steve said there it is again. I looked to where he pointed and saw a large white bird, which I stated. He said right below that. I saw nothing. He then proclaimed MASKED BOOBY. The large white bird I had spotted. The booby came right by the boat, eventually flying directly over it, giving all fantastic views. This bird was a lifer for most of the people on board and an unexpected find ( I had the bird a couple of times previously). They continued to spread a chum slick with renewed hopes of good birds. That’s exactly what we got. 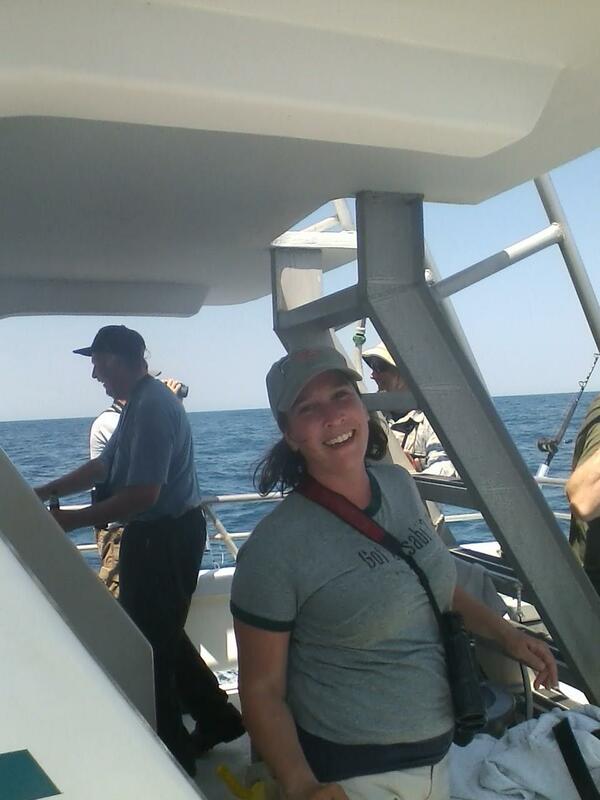 As I stood at the side of the boat, I heard Kate yell EUROPEAN STORM PETREL. I raced back as the team described to us where it was. It was coming closer and closer, yet I hadn’t spotted it. Just then, it came right to the back of the boat. The smaller size, black wings and back and distinct white line up the underwing cinched the ID. Once on it, I was able to follow it easily. The others lost it, but I redirected them to it’s new location and everyone got on it. It was so cooperative, passing the boat several times, that everyone on the boat got great looks. Unbelievable, we hadn’t even seen a couple of the common species yet and we had one of the rarest birds in North America. We continued on, watching for the storm-petrel which we never saw again, and added many new species. Great Shearwater, Audubon’s Shearwater, Cory’s Shearwater, then Band-rumped Storm-petrels. Common Tern’s put in an appearance. Finally, Black-capped Petrels showed up. What a morning, some of the people already had eight lifers. As it seemed things were just slowing down, someone yelled FEA’S PETREL. This bird couldn’t have been more cooperative. It made several nearby passes of the boat, giving all great views. This was my fourth lifer in two days. When all the excitement finally subsided, things did get quiet. We did have an Atlantic Spotted Dolphin cruise along in our wake for some time. We cruised on, seeing many more of the same species we had seen earlier, but four rarities for the day was it. When we finally arrived back at the dock, everyone was exhausted. What a great day. One young man, Bob, was on his very first pelagic ever. He had tallied nine life birds on the trip. Can you even imagine, European Storm-petrel on your first pelagic ever. Tomorrow, Great Dismal Swamp. Day four: Up early to meet Kate at the dock to pick up my tee shirts and make my final farewells. Then Eddie and I were off to the north. Great Dismal Swamp. I was making my visit to the east side of the swamp on rt 17 Visitors Center. When we arrived, it was much smaller than I thought. It didn’t open until 9am and it was only 8:30 so we decided to walk the “Canal Trail”. I had heard that Swainson’s Warlbers were found here earlier in the week. As we walked along the canal, I found Ruby-throated Hummingbird, Acadian Flycatcher and Cedar Waxwings. As we walked along I suddenly heard the distinctive song of the bird. We rushed along to the end of the trail and the bird sang loudly just across the canal from us. I spished and spished, but could not bring it out. In as much as I had seen the bird before in the Bahama’s, I now had my ABA bird and left it singing in peace. I also had my life ZEBRA SWALLOWTAIL BUTTERFLY at this spot. They seemed to be everywhere on the clover. We walked around a while longer, but decided to head out to start our long journey north. As we traveled the roads north, I added a few more species like Great Blue Heron and Northern Cardinal. As we crossed the state line into Virginia, we completed the North Carolina Birding trip. It was sure eventful. Four lifers and one new ABA bird, a gratifying trip. Though I wasn’t able to get any bird photos myself,(took the crew shots with my phone) you can go to http://seabirding.blogspot.com/ to see some of the great shots that Steve, Dave and Kate were able to get of the birds. Check out dates 5/30 and 5/31. In conclusion, I have to say my Pelagic on the Stormy Petrel 2 is one of the best pelagics I have ever been on. The trip was $150.00 per day if you were doing more than one day ($160.00). This trip offers the most unique experience available in pelagics in North America. The list of birds possible is amazing and many are not able to be seen anywhere else. It is still possible for me to get another 8 lifers on these trips, so I will be back in the future. I can’t recommend it more. You’ve decidedly out-Petreled me. One of these days . . . . . Great report. Great Sullivan birds as well.